Home » All Forums » [EVGA Graphics Cards] » EVGA GeForce 20/16 Series » Can confirm the 2080 Ti Black Edition is great. Hot!Can confirm the 2080 Ti Black Edition is great. With no overclock it is running around 1700+mhz steady at 76c after running Heaven benchmark for about 10 minutes straight. 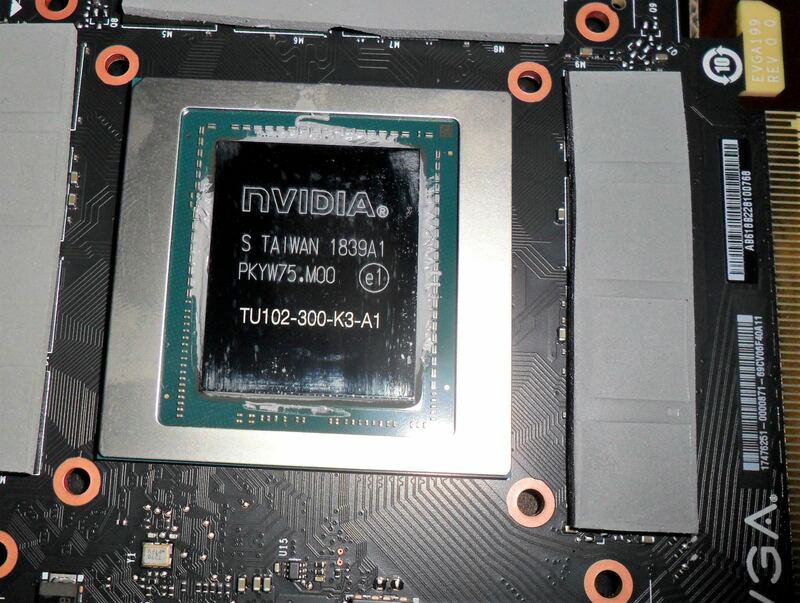 I am going to put it on a water block in a few and see what kind of stable OC I can get. Edit: It appears that it doesn't have the binned GPU. But it still well, and ran very well with stock cooler without OC. Scroll down to see my image posts showing info on my experience with overclocking it with a waterblock on it. Nice, makes me feel better for when I get my hands on one. The black Edition is A1 (binned) or normal? Actually, I have I open right now and it has the non 300A GPU. I will post some more pics in Abit. Let's see what kind of overclock I get. How do you know which GPUs are “binned”? Has anyone actually confirmed they are binning these? Or are people just guessing? Alright, after adding the water block & fixing the memory pads I overclocked it to +180 core and +900 mem and it is running stable at about 2010mhz average while gaming. 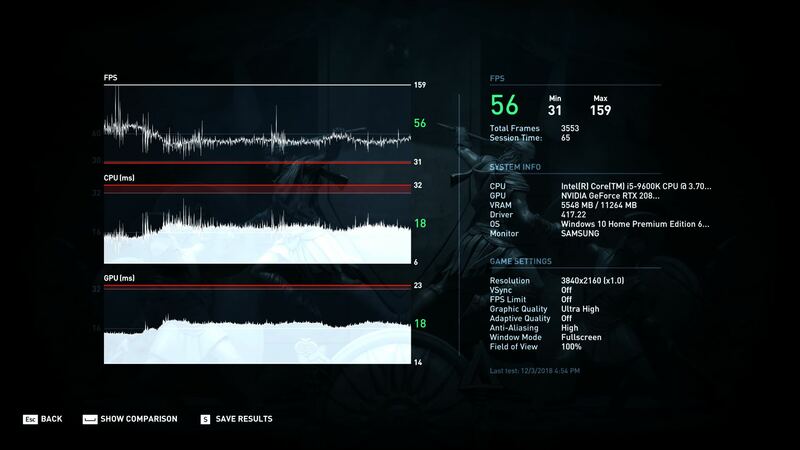 I ran AC:Odyssey(4k HDR Ultra, no compromising) benchmark & Superposition 4k Optimized to give an idea of performance. I could possibly push the card a bit further but I think I am happy where it is right now. We have the same setup! What motherboard did you get? I have a mini-itx with the gigabyte aorus pro (z390). Very nice man! I'm waiting mine to arrive on Friday. If you can keep the clock at around 2ghz in 4k that's very good because the black edition has only a 112% power limit which translates to 280w of power. Maybe in future the non-binned turing will by supported by flashing tools and get an increased power limt. Great card, it's a lot of faster than GTX1080Ti, but I didn't had other options. Look Overclocked RTX2080Ti vs overclocked GTX1080Ti, I think worth for 999$ if someone still have Maxwell, Kepler or if someone with GTX1080 want to upgrade to RTX2080Ti. But not more than that, models 350$ more expensive not worth. You don't see fps difference but it's big. 57, 72, 96 vs 72, 91, 114. I had a 2080 before this one, I definitely notice a huge difference as well. 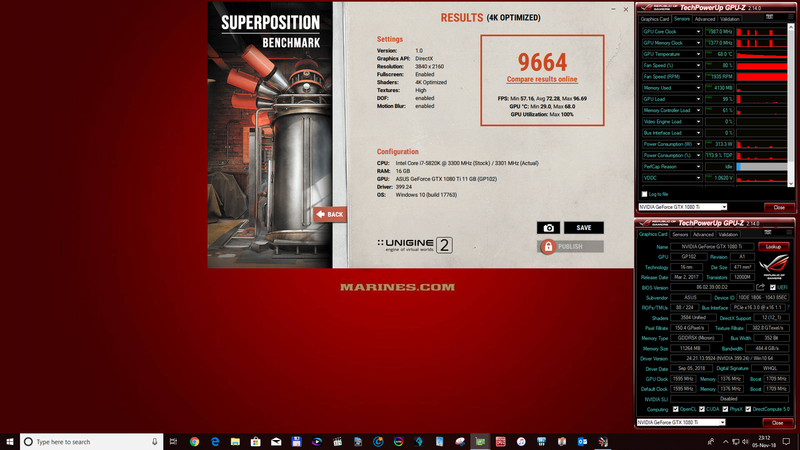 My highest superposition 4k score was "9659", and that was overclocked. 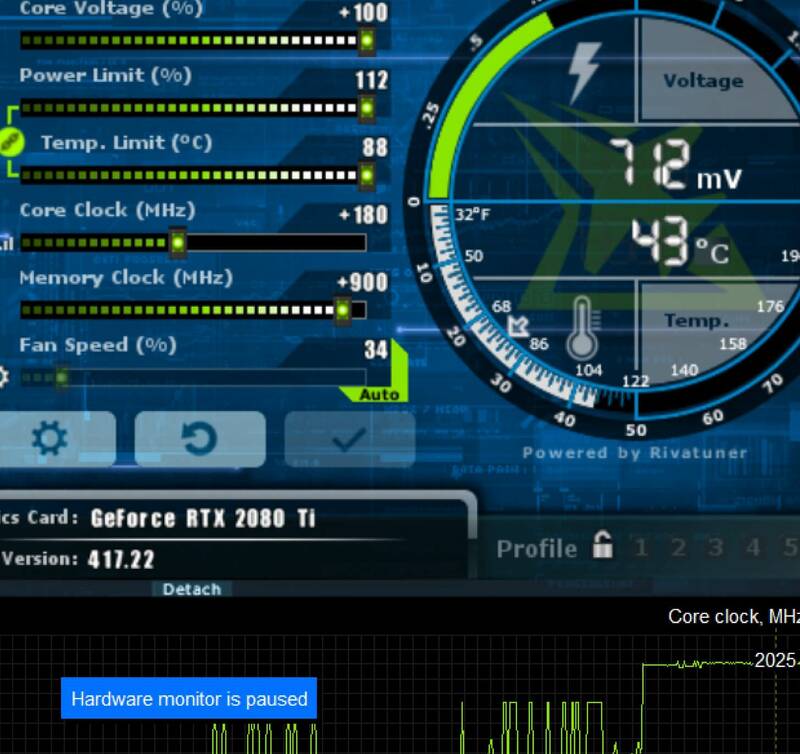 I bought some Thermal Grizzly Hydronaut paste and applied it today, it brought my temps down to 55c max with my Barrow waterblock and I am running around 2040mhz on average, sometimes 2070/2055/2025. My memory overclock is staying stable at 800+. Another 100mhz is going to be 1 or 2 fps at 4k anyway. Not worth the extra $500 to me. I did more testing today and it is running great at +180. 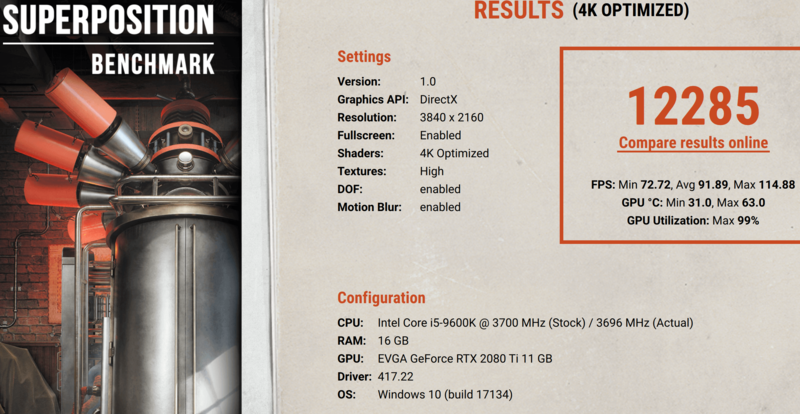 It worked at +195, but oddly my benchmarks were slightly worse. I tried up to +225 and that made the benchmark freeze. The cards are great but it seems that some of FE cards had trouble. do you recommend this card if i was to keep its stock cooler and try to overclock it as well ? Depending on temps. If you get the same temps on the stock cooler he did (76c) you won't have much thermal headroom for OC, but you certainly can a little. Just try to keep under mid 80s for extended use. I'm stable at +200 on core and +900 on memory at 2,100mhz. Fire strike score of 27,619 with a 8086k at 5.2ghz. You will have to post some compares of your Before and After your Motherboard change out. That was how I ended up retiring my X79 MBs and GTX 980 Cards. Just ordered one myself :) thanks to your thread and others like it, I was able to determine that the $999 black edition under water was the way to go. Proud to say my last 3 gpus were evga (980 ti, 1080ti), sadly I just couldn't justify the added cost of the other models this go round. I got one of the cards as well and its supposed to arrive today, however I was not sure of water cooling it as I've never done anything similar before. Is it something a complete beginner can do? I was hoping to OC it on the stock cooler but looking at what folks are saying I may not get much out of it. You don't have to custom cool it as it's a learning curve and you'll need to do the proper research. With that said, I would just go the AIO (All In One) sealed liquid cooler route as it's much more simpler with it's install, set and forget. You'll need this cooler for your GPU but atm it's not in stock and have to wait till they replenish stock again. Just sign up with auto notify. You don't have to custom cool it as it's a learning curve and you'll need to do the proper research. With that said, I would just go the AIO (All In One) sealed liquid cooler route as it's much more simpler with it's install, set and forget. You'll need cooler for your GPU but atm it's not in stock and have to wait till they replenish stock again. Just sign up with auto notify. Thanks !! While that product looks far more easier than the custom water cooling videos I saw I think I may need to watch a lot more videos before I can ever get to do this. I noticed that this AIO is ~$170 adding that to the BE GPU takes the total price to ~$1170 at that price point would it have been better to get their higher priced models with better heatsinks? Or does adding the AIO water cooling kit really do wonders for the card?